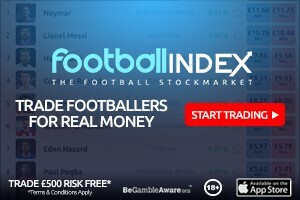 See where the Here’s our fantasy premier league team tips GW16 article where we analyse the teams of 10 top FPL managers. These 10 managers have not finished outside the overall rank of the top 10k in the last 3 seasons. Considering how variable the last 3 years have been this is remarkable consistency and shows an ability to adapt strategy in different seasons. It also gives you a view other than my own on strategy and player selection. The average score of the managers in GW15 was 56 taking into account point deductions for extra transfers. That’s compared to the game average of 45. That’s 11 points and 24% above the game average score. High score of the 10 was 77. The low score was 40. A high spread of 37 for a relatively average scoring gameweek. The top 10k captain choice (from the excellent free site FPL discovery) was 41% Kane and 23% Salah. This time not particularly close to the FFGeek poll but a not too dissimilar margin. 10 of the 10 managers made a transfer. 1 manager took a 4 point deduction, another an 8 and another a 12. So on this 1 limited bit of information the FFGeek transfer in and out polls do a reasonable job on predicting the top 10k transfer trends. 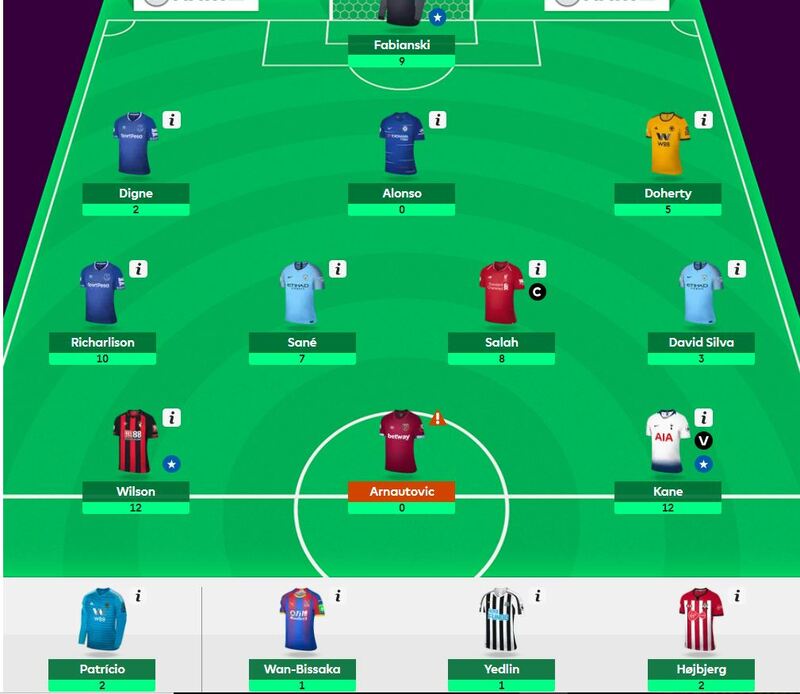 Less so for the 10 top FPL managers. Here’s a team which tries to make a combination from the most represented players. It is meant to be a menu of players rather than a realistic team. The TV is £104.7m. So that’s 6 essentials and 3 maybe nots. This leaves room for 5 differentials/bench 2 pointers. Here’s the top scoring manager who’s currently in the top 150. His team value is £104.6m. A good score of 68 this week. His transfer this week was Aguero out and Kane in. He owns 5 of the essential 6 with no Liverpool defender. All 3 of the 2nd tier “essential” of Salah, Arnautovic and Wan Bissaka. That’s 4 pretty good players plus Digne to make up overall rank ground up with. He has £3.3m in the bank so not quite enough for Arnautovic to Aubameyang but enough for Lacazette. 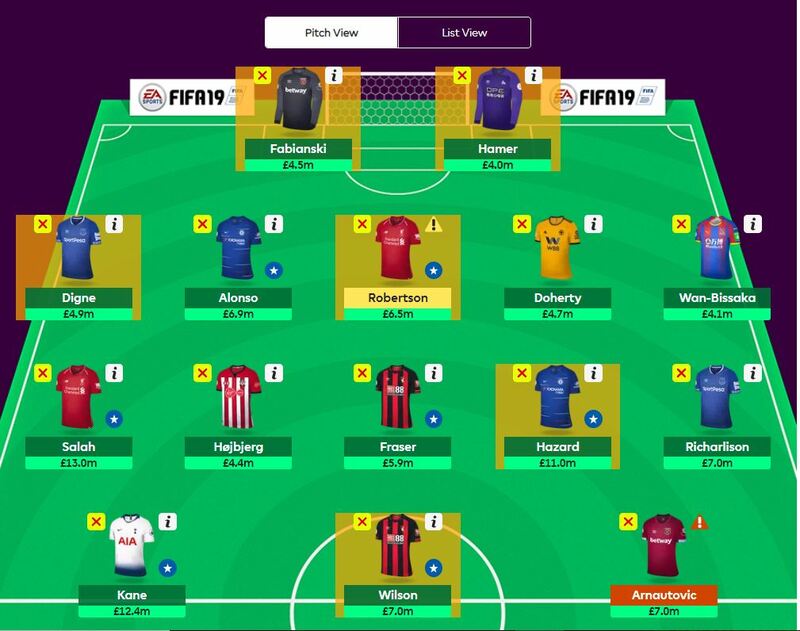 Any suggestion for gw16 free hit team? Bro, I truly believe you should be tracking the top of the top managers, i.e. total top managers finished in top 5k for the past 4 consecutive seasons. From my research, their average overall point is 20 higher than above.